Time to turn off the netflix, get out of your pajama pants, and pack your teacher bag. It's back to school after Winter Break. If you're like me, you might be double checking your calendar to find out where the heck all your time went and planning for the week ahead. 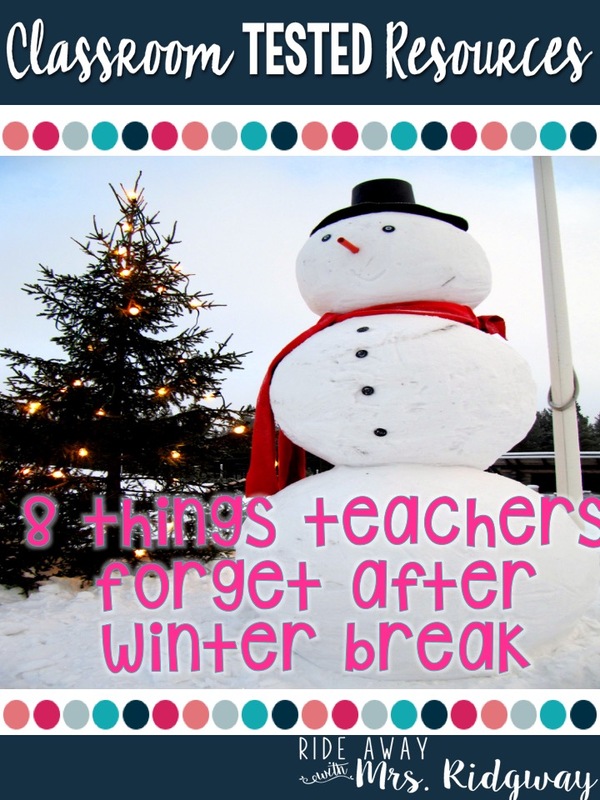 Many teachers have the hardest time of their year right after winter break because they forget 8 simple things. Hopefully these tips will get you and your class back to school and back on track. The biggest mistake we make as teachers coming back from break is assuming that our kids remember how things run in the classroom. Let's be real for a second and remind ourselves that they have been on break with little to no routines that relate to you and your classroom. So be proactive instead of reactive by verbally and physically reviewing those procedures that make your class run. You know how hard it is after break to prep your lunch, outfit, and go to bed on time... your kids are also having a hard time getting back into the swing of things too. A good idea to help your class be successful is review the routines of your classroom. I can't stress how important this tip is to helping you make it to your next break and the end of the school year. Take time either the day before or the first day back to try to call each parent. It might be a daunting and sometimes tedious task, however it puts you back into their minds as a partner in their child's learning. Try not to make negative phone calls during this time. I like to think of this as a time to make deposits in my parents account. The more you have called a parent about positives the more supportive they are with negatives. 4. Check your class list. It's sad, but many families choose Christmas break as a time to move because it is a natural break and makes for transitioning their families. I like to check my class list at least 2 times before break is over just in case I have a student move in or out of my classroom. Makes for easier planning and prep later. Now is the time to go through your school supplies and make a list of what you are low or out of. You can take advantage of those teacher gift cards at this time. Or send that list out to your parents to see if they are interested in helping out with a pack of glue sticks and sanitary wipes. If that's not successful, at least you now know what to add to your grocery list this week. Yes. I did just use the P word during Winter Break. But now is the time for you to look ahead and decide what big projects you want to put into your calendar. What will they need to be successful and about how much time can you devote to said projects? Also think about where you want your kids to be by a certain point. Are there any big test to consider and how are your kids going to be ready for said test? Now is the time to think of these things before they sneak up on you. 7. Spend time spiral teaching. I know it's tempting to start that brand new unit on the first day back but remember your kids haven't had to practice those skills you taught back in December for a while. Ease them back into it by reviewing previous material. Play a game, do stations, etc. You may think that your kids have already grasped it but you might just be reteaching to that one kid who didn't get it the first time. 8. Make the best of the rest of the time. So you are half way through your school year. Think back to August. Your kids came to you a bit younger and less experienced. Since then you've watched them grow a bit taller, a bit smarter, and hopefully more mature. You can look at the rest of your school year much like a glass that is filled half way. You can lament in the teachers lounge and count down the days until the next break... OR.... You can think about the awesome opportunity you get by seeing how much your kids can grow.